This stunning tapestry "Strawberry Thief Decor" shows a work based on the stunning art of William Morris' original Strawberry Thief. Morris's works were inspired by his garden, and in this piece we see spotty breasted thrushes stealing strawberries from his garden. 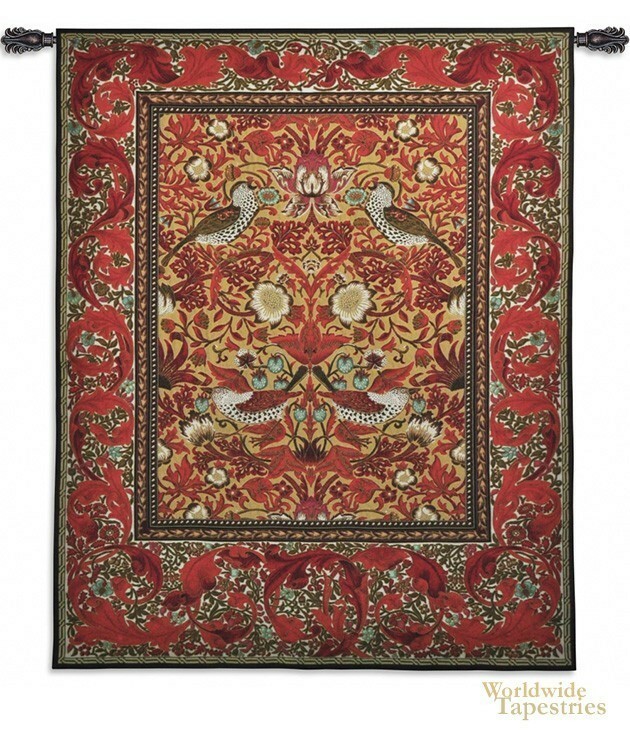 The central design is symmetrical and features an array of bird and floral motifs. Beautiful cream and white flowers are seen along with rich red foliage designs. The border is intricate and makes beautiful use of the acanthus leaves, a hallmark of William Morris tapestry and design art. This work is sumptuous in its use of rich color and detail. This tapestry "Strawberry Thief Decor" is backed with lining and a tunnel for ease of hanging. Note: tapestry rods and tassels, where pictured, are not included in the price.